There's a new “whole wheat” on the block: ultragrain white whole wheat. Neither had I… until Sarah asked if the hard white wheat she loves to use is the same as this new ultragrain white whole wheat. So I looked it up, and oh my! I know I shouldn't be shocked… but I was. You see, the new “ultragrain” white whole wheat is used in all kinds of refined baked goods — with the “whole wheat” and “healthy whole grains” labeling, of course — to make people think they're doing something good for themselves. Except they aren't. 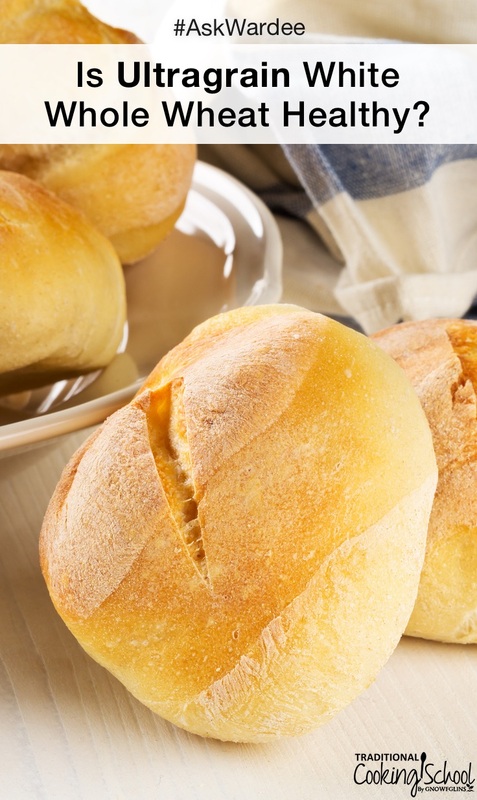 Foods made with ultragrain are no better than those made with white flour. Yet to answer Sarah's question… how does ultragrain compare to her beloved white whole wheat? Which is better? Or should she be using something altogether different in her homemade sourdough baked goods? On today's #AskWardee, I'm sharing my opinion on all of it! Q: Is Hard White Wheat As Bad As Ultragrain White Whole Wheat? Hello! I'm hoping you can help me. I have been following the Weston A. Price diet for a few years now and am just getting into baking sourdough bread. I have purchased hard white whole wheat flour, and I am wondering if it is healthy. I found an article from the Weston A. Price Foundation about Ultragrain White Whole Wheat (see the bottom of this article), but I am having trouble finding if there are any problems with baking with hard white whole wheat flour. I really like the texture it gives my sourdough, and I'm hoping that it's on the “ok-list”! Thank you so much! First, What's Hard White Wheat? Hard white wheat is a variety of wheat that's been around a long time, just like hard red wheat that is mostly commonly used and called “whole wheat”. Neither of these are “new” like Ultragrain, which we'll discuss next. Hard white wheat has been around for a long time, and, ironically, was one of those hard-to-find grains until fairly recently. White wheat carries the recessive gene for pigmentation, and in its natural state is the same nutritionally as hard red wheat, except for the lack of color in the bran. Because it lacks the red pigment, it also does not have the phenols which impart a slightly bitter taste to pigmented wheats (akin to the tannin in tea) and so the slight natural sweetness of wheat is more apparent. So, it's the same as hard red wheat nutritionally, the only difference being the lighter color and non-bitter taste. What's Ultragrain White Whole Wheat? ConAgra, which spent almost 10 years on the hybridization of the new white wheat as well as its milling process, has produced, in Ultragrain, an even sweeter wheat with a thinner bran. The patented milling process pulverizes the grain to such a degree that the particles are practically microscopic, and the flour can be used in all commercial food processing applications that currently use refined flours. All the hullabulloo has to do with what the food industry must consider a win-win situation: the new (non-GMO) wheat hybrid and new patented milling process by ConAgra create a whole wheat flour with just about none of the qualities we associate with whole wheat, so customers used to the taste of refined flour products may virtuously purchase the new “whole wheat” versions and expect no unpleasant surprises. So, the new ultragrain white whole wheat, just a handful of years old, is sweeter, less heavy through hybridization, and more refined through a patented milling process that actually pulverizes the grain. It's pretty much interchangeable with refined flours (because it is refined itself) and therefore has none of the “healthy” qualities of whole wheat — taste or nutrition. And now, there's a flood of “whole wheat” products in the marketplace using this flour! When people see the label “whole wheat” or “healthy whole grains”, you can bet they think these foods are good for them. Yet they're as refined and unhealthy as ever, especially when you consider they probably still contain a whole host of other things we should avoid at all costs, like sugar, genetically modified corn and soy, preservatives, artificial colors, etc…! Sarah, the hard white wheat you're using in your homemade sourdough bread is soooo much better than ultragrain! However, even hard white or hard red wheat are a far cry from the ancient wheat einkorn or other ancient varieties like spelt or emmer. Einkorn is civilization's first wheat, grown by farmers 5,000 years ago. It's healthy and tasty — and my family has been exclusively baking with it for a couple years now. Because of the gentler, older form of gluten, and the gentler starch, we find we digest it better than modern wheat. And where modern wheat can trigger slight seasonal allergies for me, einkorn does not. Read more about einkorn here and here. Einkorn is a bit tricky to figure out how to use because it behaves differently. 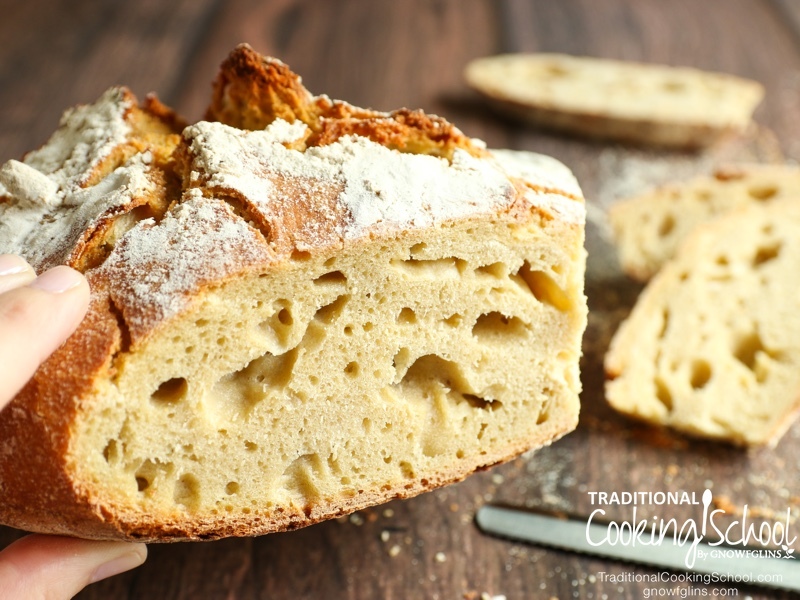 Yet… you can skip the learning curve by using my free and AMAZING no-knead einkorn bread recipe! What's your opinion on the “whole wheat” baked goods using ultragrain? Question about Ultragrain White Wheat: Does ConAgra’s milling process involve first removing the bran and germ, as is customary for milling refined flours? If not, then no, it isn’t just like refined flours, but the question then becomes, “What does that aggressive hyper-milling do to the beneficial nutrients and fiber of the germ and bran?” Are they overheated by this milling process? What actually remains or is changed, nutritionally? And no, I would not look to ConAgra testing for that answer! Is the Trader Joe’s White Whole Wheat flour a truly whole wheat flour, different from the ones with the problems? Per Trader Joe’s website, explains that the White Whole Wheat goes from farmer to their supplier’s mill to the stores. The White Whole Wheat Flour is milled from premium white wheat grown on the high plains of the Midwest and Colorado. It sounds like a good wheat. I hope that helps. Hi Wardee. I was watching your #112 about ultraflour and you mentioned einkorn wheat flour. I’m learning how to make sourdough and doing pretty well. I’m interested in trying einkorn flour, but I’ve only found whole wheat and all purpose flour. Is there someone the mills einkorn bread flour. I would rather not use all purpose flour. I don’t get as good of results.